After you set up a cash account in Quicken 2012, you can use it to track the cash you receive and spend in the same way that you track the deposits and checks for a bank account. 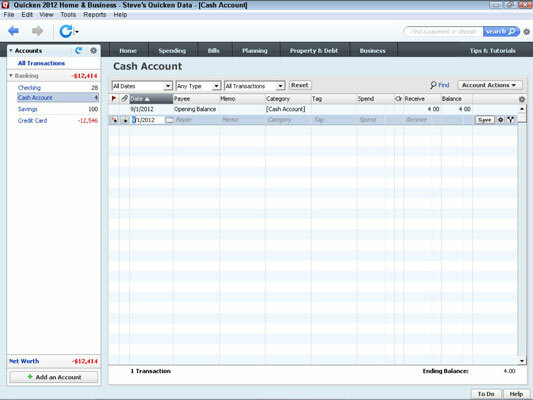 To record your cash inflows and outflows, use the QuickTab for the account, which should appear on the Accounts bar. Until you start entering transactions, only the first opening balance transaction shows. The cash account version of the register. To record the amount of money you spend, fill in the Date, Payee, and Spend fields. To record the amount of money you receive, fill in the Date, Payee, and Receive fields. 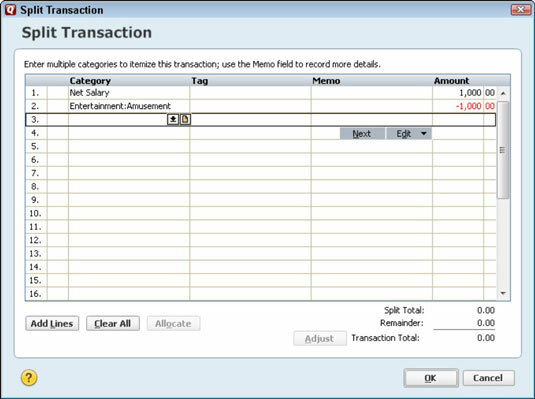 To track the reasons that you’re receiving and spending the cash, use the Memo and Category fields. By the way, you don’t necessarily need to set up a cash account if you like to spend cash (rather than, say, write checks or charge on a credit card). If you just cash a check and you do have a bank account set up, you can record the transaction in another way that may be simpler: Just use the Split Transaction window to show both the income category (Salary, for example, for an individual) and how you’re going to use the money. For example, if you cash a $1,000 check and you plan to use the $1,000 for spending money, you may show a positive $1,000 in the Net Salary category and a negative $1,000 in the Entertainment:Amusement spending category. Note that the transaction produces a transaction that equals zero. This is correct. Cashing a check that you never deposited doesn’t affect your checking account balance. But by filling out the Split Transaction window, you do end up recording both the $1,000 of income and the $1,000 of expense. Display the cash account register. Click the Account Actions button and choose Update Balance. 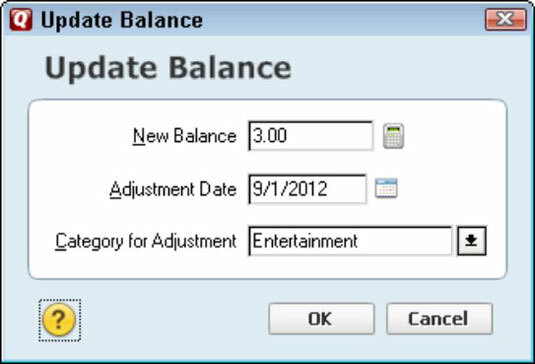 Quicken displays the Cash Account: Update Balance dialog box. Enter the actual cash balance in the New Balance text box. Enter a date in the Adjustment Date text box. Choose the category that you want to update in the Category For Adjustment drop-down list box. After you click the arrow to the right of the drop-down list box, you get a list of all the categories that you have set up. After you finish, click OK.
Quicken updates the cash account’s balance.